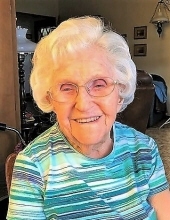 MARIE O. FARR, 100, a lifelong native of the Forest Grove community, died Monday morning, March 18, 2019 at her home. MARIE OLIVE FARR was born February 27, 1919 on David Hill in Forest Grove, Oregon, the daughter of the late Ervin William Bailey and Ethel Elizabeth (Sears) Bailey. She was raised and received her education in the Forest Grove community, having been a graduate of the Forest Grove High School Class of 1937. Following her high school graduation, Marie went to work for the Loyal M. Grand Attorneys in Forest Grove, Oregon. From there she worked for the Labor Union in downtown Portland. She was united in marriage to Byron Richard Farr on June 18, 1938 in Forest Grove, Oregon. Following their marriage they made their home in Portland until World War II, when they moved to Vallejo, California, where they lived from 1941 to 1945. Following the war, they returned to Oregon, settling in the Newport community, where they made their home until 1948 when they moved to the family farm in the Watts district, west of Forest Grove. Marie was preceded in death by her husband, Byron, on May 11, 1994 in Forest Grove, after celebrating fifty-five years of marriage together. She had worked for Pacific University as secretary to the Dean of College of Optometry. Upon working for thirty years, she was secretary to four different Deans. She earned many awards, including Honorary Member of the THETA Chapter PHI THETA UPSILON International Optometry Fraternity, contributing to the support of the students of the Pacific University College of Optometry. Upon retirement, the University gifted them a wonderful trip to Hawaii. Among her special interests, she enjoyed swimming, knitting (knits a dishcloth most everyday), gardening, going to the beach, reading to elementary students at Echo Shaw, and volunteering at Valley Art. What she enjoyed the most was belonging to the Volks Walks with her husband, Byron. It took them to many places in Oregon and saw everything first hand. Marie always loved being a part of the Forest Grove community. She was also preceded in death by her parents, Ervin and Ethel Bailey; her two sisters, Eleanor Stout and Marilyn Reynolds and her son, Byron “Richard” Farr, II. Survivors include her son and daughter-in-law, Harry and Beverly Farr, of Beaverton, Oregon and daughter-in-law, Betty Farr, of Forest Grove, Oregon. Also surviving are her five grandchildren and their spouses, Jeannette and Rob Ashbury, of Stevensville, Montana; Amy Farr-Vanoudenhaegen and Scott Vanoudenhaegen, of Tigard, Oregon; Jennifer and Don Lyda, of Forest Grove, Oregon; Kevin and Kimberly Hernandez, of Tigard, Oregon and Brian and Angel Hernandez, of Scottsdale, Arizona; her four great-granddaughters and their spouses; JoHanna and Kolby Kent, of Forest Grove Oregon; Tasha and Domenic Blantner, of Hillsboro, Oregon; Savannah Lyda, of Hillsboro, Oregon and Chelsea Cunningham, of Portland, Oregon and her grandson, Jackson Hernandez, of Tigard; her three great-great grandchildren Benjamin, Amelia, and Henry Kent, of Forest Grove, Oregon; her three nieces, Sue Reynolds and Sandy Lane, of Clackamas Oregon; Vickie Kroger, of Milwaukie, Oregon and Venessa and Ben Ortiz, of Cornelius, Oregon; and her cousin, Barbara Daniels, of Vancouver, Washington. The family suggests that remembrances may be contributions to the Valley Art Association, PO Box 333, Forest Grove, Oregon 97116, in her memory. To send flowers or a remembrance gift to the family of Marie Olive Farr, please visit our Tribute Store. "Email Address" would like to share the life celebration of Marie Olive Farr. Click on the "link" to go to share a favorite memory or leave a condolence message for the family.